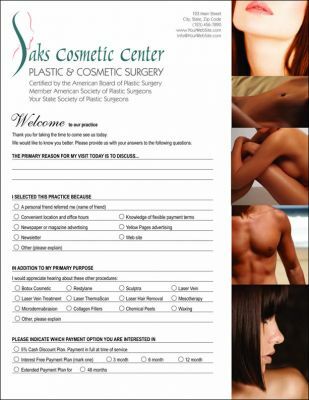 Cosmetic practice and surgery forms, patient intake forms, post op instruction guides, pre-op guides, botox, restylane, personal history, routing slip, superbill, super bill, patient history, patient sign in, botox consent form, new patient, new client, photography release, video release, interview release forms, and more. 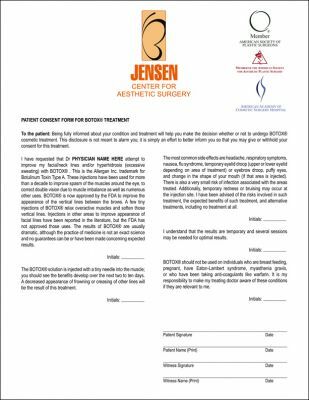 General botox, facial injections consent form. Patient authorizes physician to perform Botox injections into muscles covering patient's forehead, face, chewing muscles, scalp, neck, or upper back. Form may be modified or edited to meet your own practice needs. 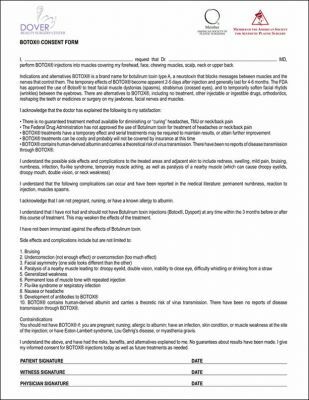 Botox Treatment Consent Form. 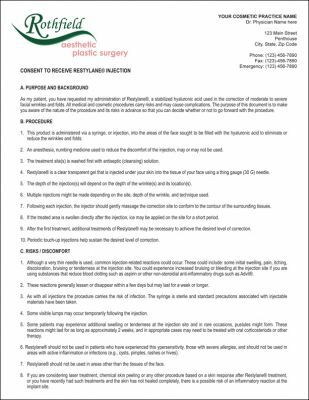 Patient authorizes physician to perform cosmetic treatment and is disclosed information concerning Botox, how it injected, side effects, what to expect, patient also acknowledges the limitations of Botox treatments and possible side effects and dangers. Patient consent date and signature signature lines at bottom of form. 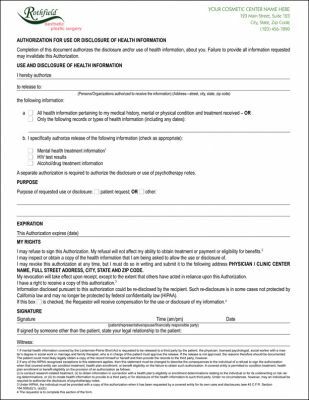 Physician should examine form to see if it may benefit his/her practice to help keep patients legally informed. 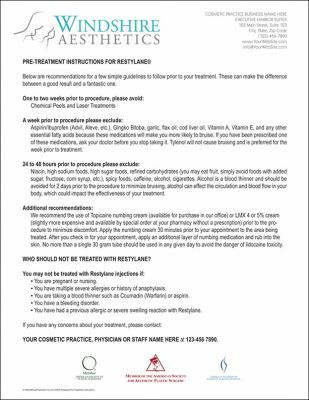 Pre treatment instructions for Restylane® treatment, leaflet with instructions for patients who will be receiving Botox injections. What to expect, what to do prior to treatment, what to do 24 to 48 hours before treatment, additional recommendations and notice of who should not be treated with Restylane. To avoid legal issues be sure you patient is well informed, before and post treatment. An Authorization for Disclosure of Health Information is an individual's signed permission to allow a covered entity to use or disclose the individual's protected health information (PHI) that is described in the Authorization for the purpose(s) and to the recipient(s) stated in the Authorization. The form's purpose is to obtain patients signature to be able to use or disclose health information. English and Spanish bundled together. A welcome form, sure to impress your clientele upon receiving it. Learn more about your own clients by obtain information as to the primary reason why they are visiting your cosmetic practice, why they selected your practice and also inquires about other cosmetic procedures they may be interested in being informed and their preferred payment option(s). 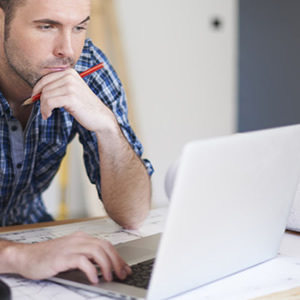 Easily edit the form to your particular questions using Microsoft Word or other compatible word processor. Proper, specific, and reproducible labeling of anatomic locations of dermatologic lesions or therapy is important to record as part of a patient's medical history. These drawings can serve as a list of locations treated (e.g. with Botox, etc.) proving very useful on patient's next visit. 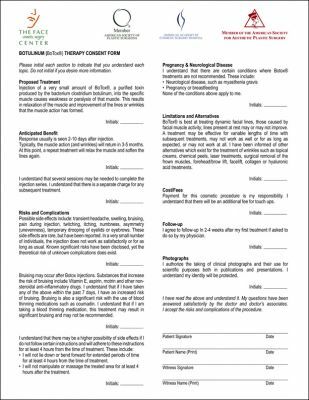 Botox Therapy Consent Form. Patient authorizes physician to perform Botox injections and is informed of all that is related to the procedures such as the proposed treatment, anticipated benefits, risks and complications associated with treatment, Botox limitations and alternatives, costs/fees, follow ups, photographs, etc. 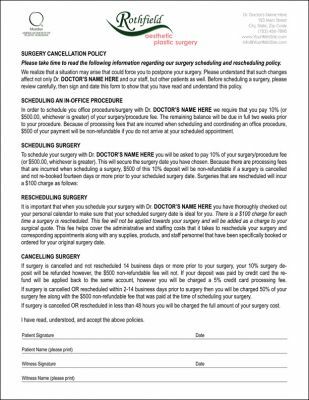 Consent signature is at bottom and patient consents that all above questions have been answered and accepts the risks and complications of the procedure. 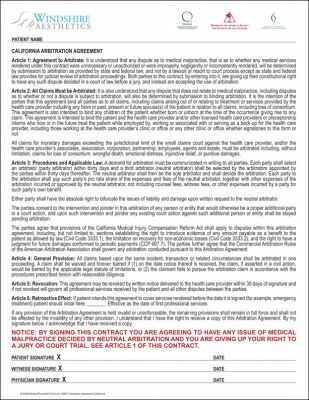 Avoid malpractice suits that can tarnish the physician's reputation and raise malpractice insurance premiums by having your client accept binding arbitration of any dispute, avoiding the client's right to a trial. For use in California. 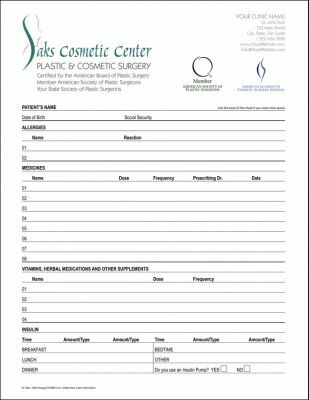 General Restylane®, facial injections consent form. Patient authorizes physician to perform Restylane injections into muscles covering patient's forehead, face, chewing muscles, scalp, neck, or upper back. Form may be modified or edited to meet your own practice needs and or other types of fillers and treatments. 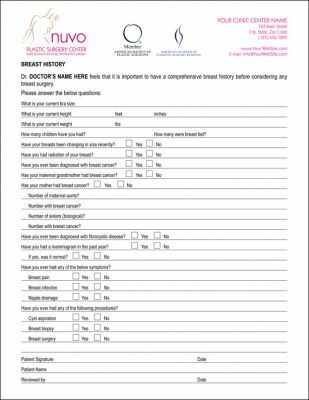 This form is used provided to client by physician so he can obtain a comprehensive breast history prior to considering breast surgery. Includes both, sections for written responses and multiple choice using check boxes. Fully edit the questions to your particular practice needs.